Tepe's wide selection of interdental brushes offers an option for every need. Whether you prefer a short or longer handle, an angled or straight brush head or original or extra soft filaments, you will find a brush that suits you. The most common oral diseases start between the teeth, but both gum disease and caries can be successfully prevented by daily use of an interdental brush. 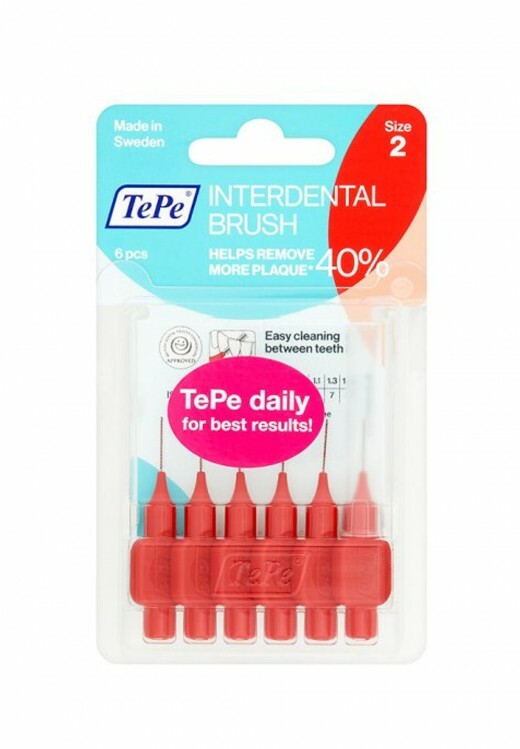 Tepe's user-friendly interdental brushes are available in several colour coded sizes, all with plastic coated wire. The ergonomic handle enables cleaning with steady and controlled movements. Turn the bush slightly when inserting between the teeth. Move the brush back and forwards a few times. Rinse after use. Never force the brush into a space. Use daily, change when worn. Do not bend the wire at right angles. Turn the brush slightly when inserting between the teeth. Move the brush back and forwards a few times. Rinse after use. Never force the brush into a space. Use daily, change when worn. Do not bend the wire at right angles. Safety Warning - Consult your dental professional for additional instructions. Keep out of the reach of children.